It’s the SAPInsider conference this week in Orlando Florida, with co-hosted conferences BI2017, HANA 2017 and Basis & SAP Administration 2017. 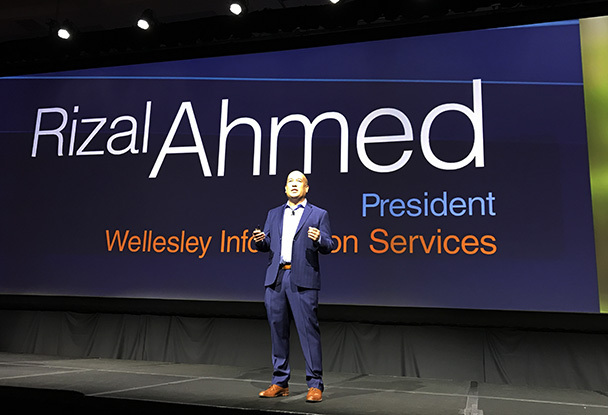 Rizal Ahmed, President of Wellesley Information Services, kicked off the conference. He talked about the challenges of explaining what he does to his young son. “You remember that story about Newton and the apple? Well, we help shake the tree”. “You try to kill people with apples?!”. Next, Mike Flannagan, SAP’s new Senior Vice President of Analytics Strategy did a presentation on driving insights to outcomes across the business value chain. Mike recently joined SAP to head up analytics after many years working at Cisco. He shared why he had accepted the role, and why he was so excited about the future. Bimodal is the practice of managing two separate but coherent styles of work: one focused on predictability; the other on exploration. Mode 1 is optimized for areas that are more predictable and well-understood. It focuses on exploiting what is known, while renovating the legacy environment into a state that is fit for a digital world. Mode 2 is exploratory, experimenting to solve new problems and optimized for areas of uncertainty. 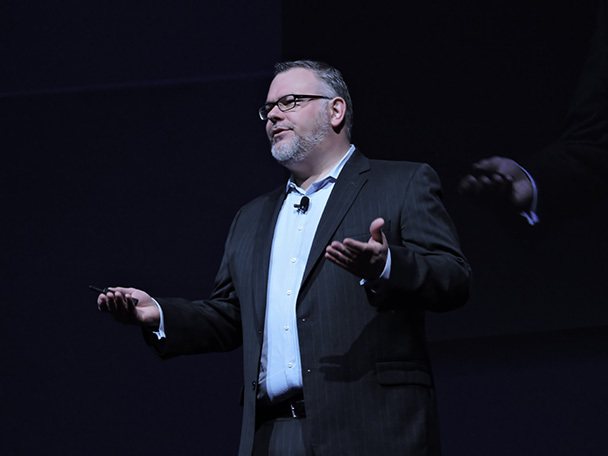 Both these modes play an essential role in digital transformation, but marrying the more predictable evolution of mode 1 products and technologies with the new and innovative mode 2 approach is challenging — Mike likened it to trying to change the tires on a fast-moving car. “We’ve looked at data forever. But while looking at what happened in the past can be interesting, what we really want to know is what’s going to happen next, and then we want to be able to actually change that outcome. Everybody in the industry talks about being able to do this. But there’s a big difference between making a decision and actually doing something. For example, I decided yesterday that I would go running this morning and eat a healthy breakfast — but it didn’t happen! What I found really compelling about about SAP is that it’s able to do every step on the chain and actually get to a better decision: you can look at the past, make a prediction, do scenario planning for the future, and implement the decision back into the operational decisions. “This got me very excited, because you don’t usually see see companies with both applications and insights. 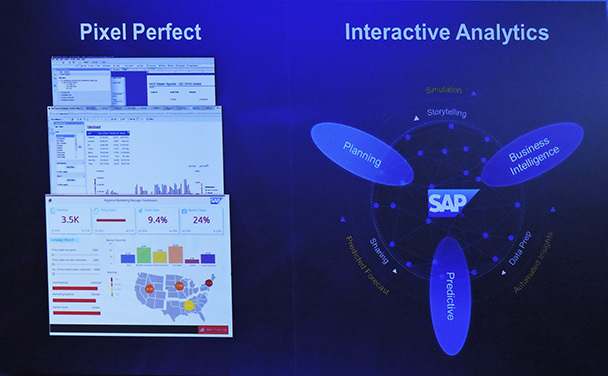 I find SAP’s vision very compelling: it’s not about analytics on the side of core business applications, it’s about having intelligence embedded in the way we work. Today, if you work in human resources or procurement, you have to stop what you’re doing, go to another system to do some analytics, and then go back to your job. 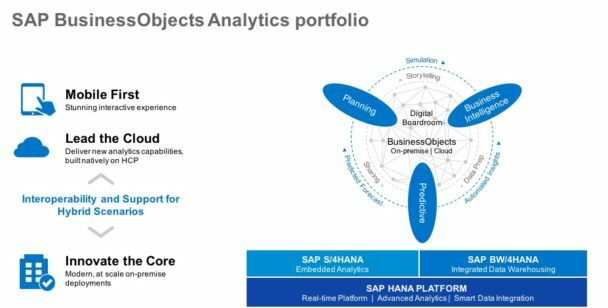 SAP is one of the few companies that realizes that you need analytics in the workflow — and actually has the resources to be able to implement that. Mike explained that the challenges of bimodal strategy to SAP as well. The company has been around a long time, with a strong mode 1 core business, but customers are also asking for more mode 2 innovation. In BI terms, the challenge is to continue to support SAP’s traditional strength in reporting, but also support new types of interactive analytics. SAP strategy is to continue innovating the core BI products while leading in new cloud analytics innovation. The key is that the new cloud platform is not just about BI — it’s really a platform to to help people use data to improve the business, with predictions, what-if scenario planning, and turning decisions into financial plans for the future. 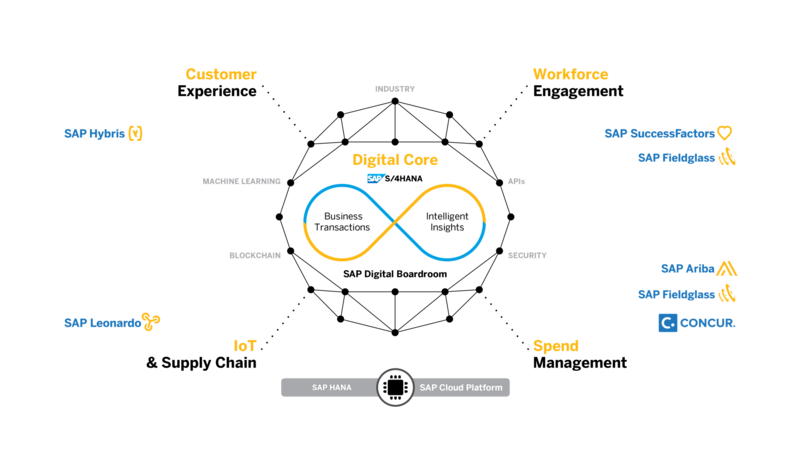 “There’s been a lots of transformation inside of SAP, and a very different approach to the product compared to where we were in the past. We’re currently running hard in both mode 1 and mode 2 – and that’s creating some interesting dynamics for me as aI work on product strategy.